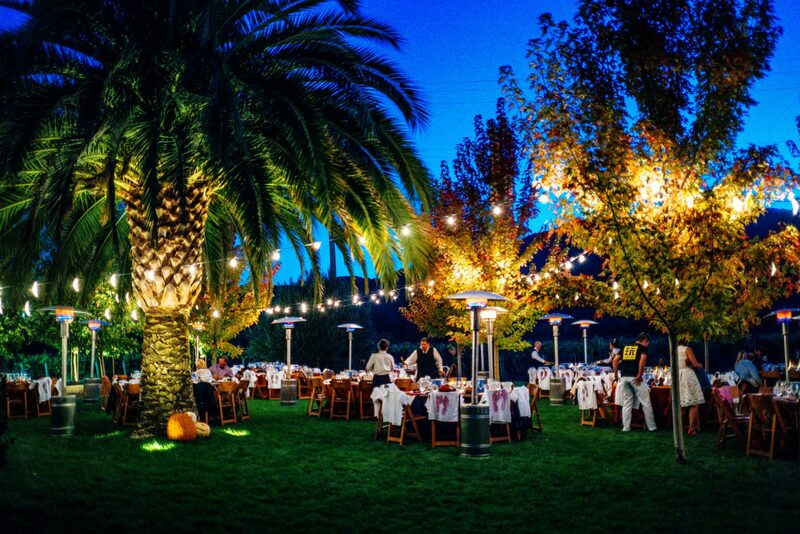 Grgich Hills Estate’s annual stomp party celebrating the end of harvest is one of our favorite Napa Valley events. What better way to celebrate the end of harvest than with a festive grape stomp and lobster feed? 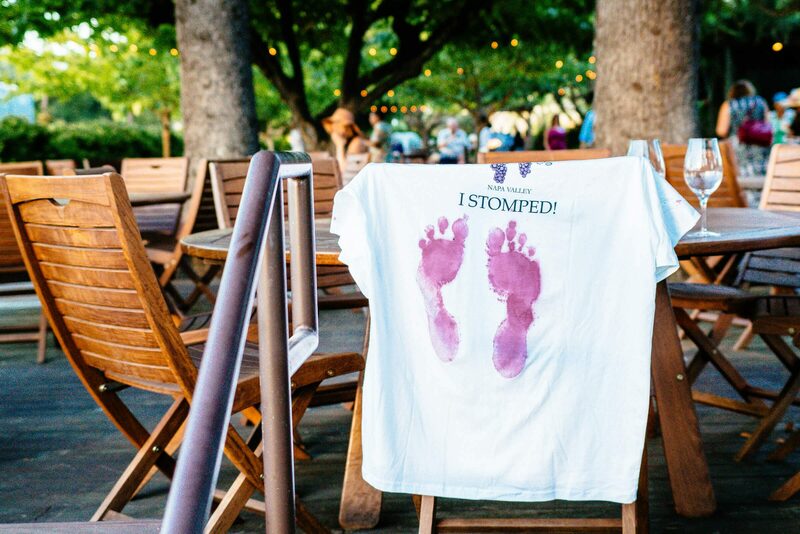 Grgich Hills is the only winery in Napa Valley that has historically offered daily grape stomping every year for guests throughout the harvest season, for as long as the owners can remember. Mike Grgich has been stomping grapes every year since he was three years old! Guests of the winery are able to grab a glass of Chardonnay and stomp away, I Love Lucy-style (episode 16), in the crisp autumn air. If you didn’t make it to the party, you can still stop in and stomp grapes at the winery during the day through the end of October. This year was exceptionally warm, and the hot day faded to a gorgeous evening. The weather was just perfect, and there wasn’t much need for heaters and sweaters until late into the evening. We made friends quickly at our table. It turns out that meeting around a messy activity like cracking lobsters and wearing lobster bibs really breaks the ice! If you go next year (and you should! 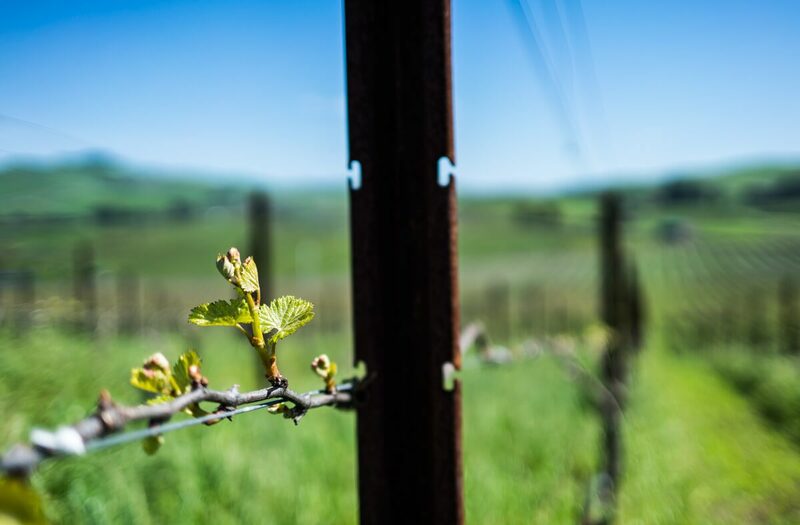 ), be prepared to sample Grgich Hills’ best wines. Guests were greeted with a glass of signature Estate Chardonnay, and the winery was pouring it’s finest wines throughout the evening: Essence, its premium sauvignon blanc, Miljenko’s Selection Chardonnay, and Yountville Selection Cabernet all made an appearance. We had such a fun evening. Ivo Jeramaz, Vice President of Vineyards and Production, made the rounds talking with guests throughout the evening. One of the guests at our table asked how she could identify age-worthy wines, and Ivo’s response was, as always, very informative. He explained that tannins in wine are like two-by-fours in a house. They’re the building blocks of the wine and give it the structure to age gracefully over time. Most wines are made for immediate consumption and lack this structure. As he explained, you can’t build a house out of cardboard! If you’re trying to decide whether to buy a case of wine for long-term aging, his recommendation is to open a bottle and have a glass, then put the cork back in, and leave it overnight. If it tastes as good or better the next day, try it again for another night. If the wine is still good after three to five nights, you know you have a wine with the potential for graceful aging. If you want to learn more about this historic winery, we’d recommend checking out Mike’s newly released autobiography, A Glass Full of Miracles and Judgement of Paris: California vs. France and the Historic 1976 Paris Tasting That Revolutionized Wine. Cheers to the end of another great Napa Valley harvest! We can’t wait to taste the small, but high quality, 2016 vintage. Thanks to Grgich Hills Estate for hosting us for this special evening. Hi Alisa, That sounds like a wonderful way to celebrate!! The best thing to do would be to reach out to Grgich Hills Estate directly for more information on their next grape stomp. I’d recommend contacting James, the event manager (events@grgich.com, 707.963.2784 ext. 128).